The article below talks about the importance of July for recruiting of high school players to universities. If anything, this holds true for JUCO basketball players even more so. This is a key month. AVC’s players will be showing their skills to the university coaches this coming weekend at the largest JUCO Summer Shootout Recruitment in the nation(16-17July 2016, Cerritos College). The schedule has not yet been posted but as soon as I receive it I will put it out on this site. 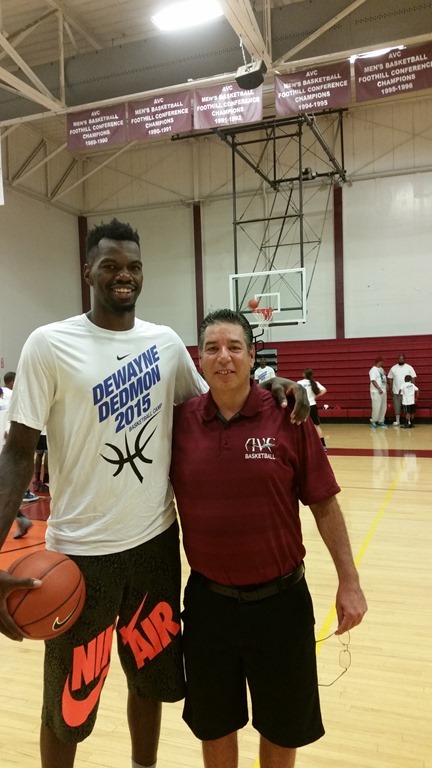 For a large number of AVC players including the $6 million man, Dewayne Dedmon, now entering his 5th year in the NBA with the San Antonio Spurs, this was their first view for university coaches. What is the July Live Period and why is it so important? Wednesday, July 6th, at 5:00 p.m. kicks off the first of three July evaluation periods, one of the most crucial stretches of the year for any college basketball team across the country. But there are many fans out there that may not be aware of what a “live period” is or what it means for coaches and the players they are recruiting or plan to recruit in the future. The NCAA rulebook is thick and it is scary and it is often confusing, but when it comes to the recruiting calendar, things are fairly cut and dry, particularly during the spring and summer months. The way it works is like this: there are only certain times during certain months where coaches are allowed to be on the road scouting and evaluating players. These are called evaluation periods, or “live periods”, and during a usual calendar year, there will be five of them: two three-day periods in April and three five-day sessions during July. The two live periods in the spring span just 48 hours each, stretching from 5:00 p.m. on a Friday through 5:00 p.m. on a Sunday. In the summer, it’s a bit different. For three consecutive weekends during July, coaches are allowed to evaluate prospects from 5:00 p.m. on a Wednesday until 5:00 p.m. on a Sunday. What that means is that during a 19-day stretch in the middle of the summer, these high school players will be in gyms across the country, essentially auditioning for the coaches that they hope to one day play for. Audition is the proper word to use here as well. No in-person contact is allowed between the college coaches and the recruits or the families of the recruits. It’s strictly an opportunity for scouting and evaluation, which creates a surreal environment at the events that take place. Family, friends, AAU coaches and the athletes themselves are all ushered onto one side of the court after entering the gym through one entrance. The college coaches are fenced in on the other side of the court after entering through a different entrance. The college coaches and the players aren’t even allowed to use the same door to get into the building. They can’t use the same parking lot. How a staff will go about traversing the country and utilizing their time during the live period will differ between programs. A team like Kentucky or Duke already knows which players in the rising-senior class they are targeting. With the kids in that class, they aren’t evaluating or scouting as much as they are following; the best players in a given class are generally pretty well-known by their sophomore year in high school. It’s a matter of the staff figuring out which players they want, and that’s normally done well before a player’s final summer. When you see Mike Krzyzewski and two of his assistants sitting court side for someone like Kevin Knox or Wendell Carter, you know it’s because Coach K is looking to add that particular big man. A general rule of thumb: the more staff members that are at a game, the more of a priority that recruit is. But that’s not the only reason you’ll see a coach stalking a recruit. If a recruit is already committed, don’t be surprised to see an assistant — or, if he’s important enough, the head coach — front and center at every game he plays during the live period, a tactic known as “babysitting”. They want to make sure that kid knows that he’s still a priority. At the high-major level, assistant coaches are generally the ones that do the leg work, identifying talents and picking out who they think would be the best fit within the team. When the head coach shows up in the stands, it’s usually to determine whether or not they want to extend an offer. How much has the kid developed since the last time the staff saw him play? Did he grow? Has he added a jumper? Did he spend the spring in the weight room? That’s why they are called “live evaluation periods”. If the head coach is at every game, it’s generally to show just how badly that program wants that player. Tom Izzo can only be in one place at a time. If a kid that Michigan State is recruiting consistently sees him at his games, that’s generally a sign that they want him to be a Spartan. It’s also worth noting here that only four members of a coaching staff — the head coach and his three assistants — are allowed to be on the road at a given time. So even if it’s just an assistant from, say, Kentucky watching Trae Young play, it should still be a sign to Young that Kentucky prioritizes him. UK can only be in four gyms at a given time. There’s a major difference in how top 25 programs and teams from smaller leagues use July. The bigger names are there to be seen. For smaller programs, the idea is to get out and see as many players as possible, trying to identify who can play at their level and who will fit in with their program and style of play. Quite often, the player that stands out during a game isn’t the player that a particular coach was trying to recruit. For example, former Delaware head coach Monte’ Ross once told me a story about recruiting former Blue Hens sharpshooter Kyle Anderson. He walked in a gym during an AAU tournament to see a team play on one court, but as he was walking to his seat, he saw Anderson, who was very lightly recruited in high school, hit a pair of threes. He decided to watch the game for a minute, and Anderson ended up having a huge game. He started for the Blue Hens as a freshman. Delaware is also a perfect example for why mid-major programs aren’t in a gym to be seen. The Blue Hens had a long, drawn-out coaching search during the spring, so long that they didn’t actually have a head coach in charge of the program during the April live periods. But that didn’t hurt their program as much as it would hurt a school like Oklahoma State. New head coach Martin Inglesby was a longtime Notre Dame assistant coach. He’s been on the road recruiting, he’s seen all of these players and he probably has a good feel for who he would be able to recruit to the CAA school. There’s another difference between high-major and low-major programs: budget. The scope of grassroots basketball is bigger than you probably realize. During each of these live periods, there are hundreds events going on all across the country — the NCAA’s list of certified events is 53 pages long — and some programs are going to be recruiting players that are playing at the same time in cities hundreds or thousands of miles apart. For a power program, this means private jets. Don’t be surprised to hear about Coach Cal making an appearance at the morning session in Georgia only to show up for the afternoon games in Indianapolis. The ability to fly thousands of miles on a whim allows the biggest and richest programs to recruit players from all over the country. For the mid-major teams, a priority is put on proper evaluation and landing local talent. For example, Northern Iowa nearly reached the Sweet 16 in the 2016 tournament. Nine of the 13 players on their roster were from Iowa. They also had two from Wisconsin, one from Minnesota and one from Illinois. Coaches aren’t only looking to find hidden gems, however. With the proliferation of grassroots basketball, the Internet and social media, and the myriad of scouting websites, players that are overlooked are generally few and far between. That’s why stories like those of Otto Porter and Ron Baker are so incredible. No, what these coaches are looking for is a development track. They’ve seen a lot of these guys play when they were younger. They watched high school games in person or on film. They’ve attended workouts. How have the recruits progressed? Is the skinny kid getting stronger? Did the chubby two-guard lose some weight? Has the dunker’s jumper gotten better? Did he improve his ball-handling? Or add a jump hook? Or utilize his ability in the pick-and-roll? That’s a lot for a coaching staff to work their way through, and they only have 15 days to do it. And that’s what makes July’s live-recruiting period so important.